You know those books that stick with you? It doesn’t happen with every book for me, but generally when it does it’s a sign of a good book. This time, I’m not sure. The book in question is Gordon Bakoulis’ Getting Real About Running: Expert Advice on Being a Committed Athlete and that is basically the passage that’s still bothering me a week later. If running is about 6.0mph and jogging is below, well then a whole lot of runners aren’t real runners according to Bakoulis. In her defense, this book is fifteen years old and said runners or joggers likely aren’t measuring their runs with chronographs either. She’s also a former elite runner and I think her views of slower runners are different from that of mainstream runners – but I think this passage is a disservice to new and slower runners all of whom run. I wonder whether her opinion on slower runners has changed during her tenure as Editorial Director at Road Runners, which is open to and welcoming of all paces. There’s no sub group for New York Road Joggers. While this was overall an OK read, I think I’ll take a pass on her other two books. I’d actually gotten this one from the library once prior and hadn’t finished it. 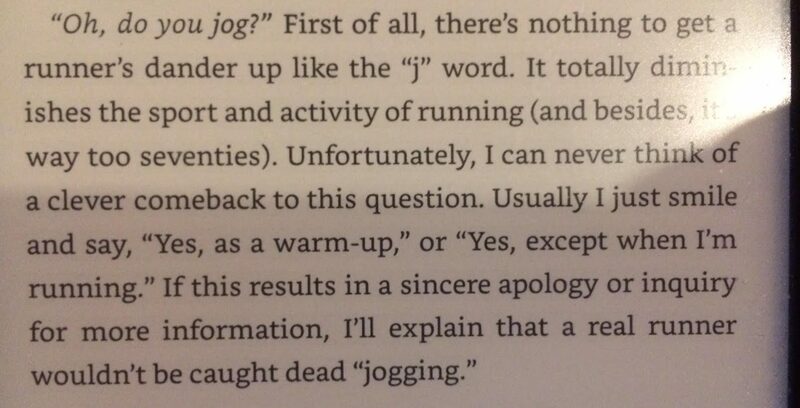 It’s not that it isn’t well written – it is – it’s just not the kind of running book I find particularly helpful. In a bizarre timing coincidence, Bakoulis was on NYRR’s Women in Running panel that Jen Lada hosted and she was fabulous as someone who had been directly impacted by Title IX’s passing vs. the younger runners on the panel. If there had been an opportunity, I’d have liked to ask her about the book, but it didn’t work out. Unrelated to the book, this showed up in a Facebook group I’m a part of, and it was exactly what I needed to see/hear. I don’t think I jog, I run. It took me the better part of a year of running to realize that I absolutely am a runner. It still feels weird. Monday: cross train. Not exactly intentionally as my knee felt OK after Sunday’s run and I could have run two days in a row, but I got to the gym earlier than normal and could not get a treadmill. So 23 minutes bike (don’t ask, I don’t remember), 10 m elliptical and 13m row (that one I know, it’s 2K). I’d forgotten my watch and headphones, this was not easy to focus. Wednesday: aforementioned panel and a day off (more on that later). Before the panel, I went to the New Balance store because NYRR was doing a promotion where in exchange for a shoe donation, you got 10% off a new pair. It was time to say goodbye to the shoes that got me started running. 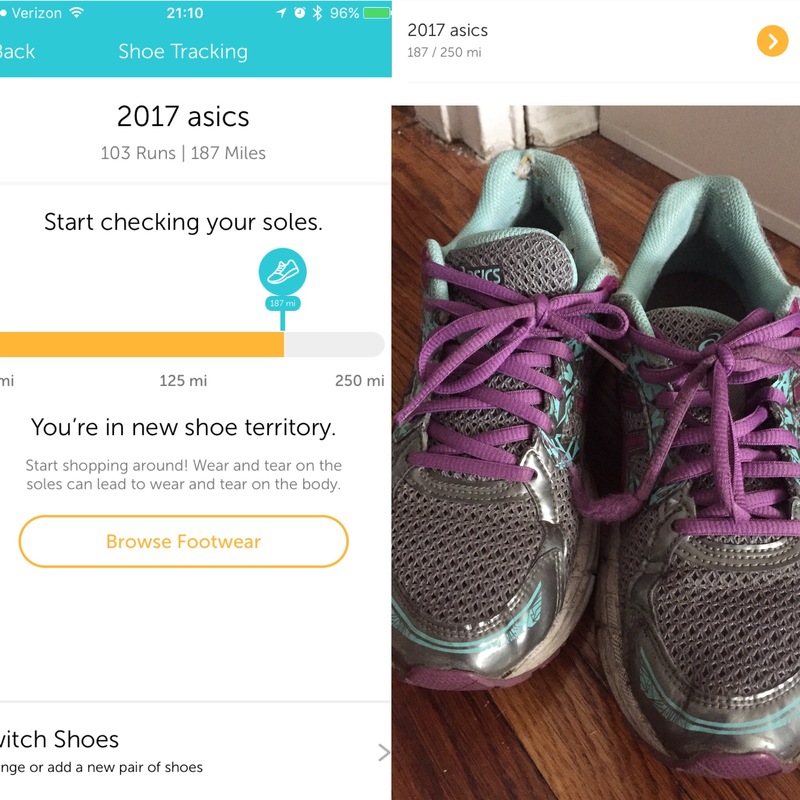 The mileage tracker is off as I wore these to and from the gym and general use (although they were new when I started running). There’s almost no cushioning left, and they’re too small. I’d hung on to them as backups, but I think they were the culprit behind January’s injury and it was time. I also have no room to keep them as a souvenir. So I took the picture and chose my running journey as the souvenir for these shoes. The purchase was another pair of Vongo2 (I’m in love) in Blue Iris & Fiji. Not as fun as my fuschia ones, but more fun than the November black ones. I’m probably going to run in them for the first time on Tuesday. Oh and they’re a nine. The fuschia ones have felt too tight and I’m not sure whether I documented it or not, but when I got the new pair in November I ended up trying an 8.5 W which worked. But when I had my feet measured this time I realized the 8.5 is really just too small. My toe is right u p there, so 9 it is. Eek. Thursday: had dinner plans and after Tuesday I knew I couldn’t dine and run so I got up early. I’d have preferred running outside, but it was just too cold so I headed to the gym. On arrival I realized my headphones weren’t charged. Oops. I wondered whether I could get through a treadmill workout without music. It wasn’t easy, but I did ~5K. 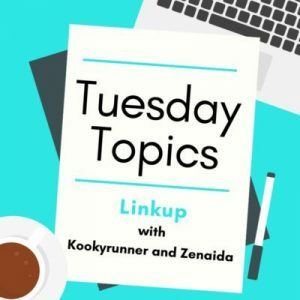 What I realized when switching to cool down and feeling a tweak in my knee: it isn’t the running that is an issue for my knee, it’s the speed changing on the treadmill. It was manageable and didn’t really have an impact on my day. I wisely decided not to go back to the gym after dinner. Friday: I didn’t have a set distance planned, I ran by feel and wore my knee brace. I was able to maintain 5.5 over ~40m and felt that was a smart stopping point. I made sure to stretch, and roll the IT Band after. Saturday: off. Errands, including a knee strap. My brace is stretched out and uncomfortable to run in, so wanted to try this before getting a new brace. I don’t think my knee is “injured” so much as irritated. This is the one that was surgically repaired and has never quite been 100%, but I don’t think it’s getting worse so much as flaring especially with three days of horrid rain this week. It hasn’t required Advil since the day after my Half, and everything needed Advil that day. Sunday: knee was stiff, so decided to play it smart. Ran about 25 minutes in the aforementioned strap and it was OK, so decided not to push it. The rower was free so I followed the run with a 5K row. All in all a great workout and while I’m icing my knee, it doesn’t hurt. I’m happy with the week and think I’m ready for Sunday’s half. 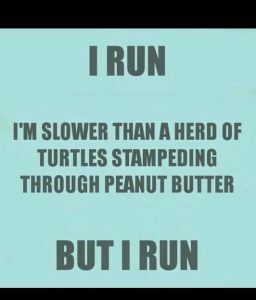 I’m hoping to get in an outdoor run or two before then to test my theory that it’s the treadmill, not running that’s bothering my knee. I’m probably not going to hit 400K steps this month and I’m remarkably OK with that. I’ve learned that rest days are essential. And days like today and Monday when the workout felt great, but rowing is just no good for steps. The increased step goal was to get me to be active — I’m doing that with the gym. I don’t feel my body will be worse off if I come in until 400K on a 28 day month. Not listening to my body would be worse. Running has been amazing for gym visits. When I was gym shopping I knew location was primary because I wanted to be able to keep running through winter. Blink has been perfect, and the towel concern has mostly been a non issue. As I was near the end of my six month window I asked about getting a report on visits and how they handled it. I need 50 to be reimbursed and as of Friday I had 63! Granted some of that was from how awful this weather has been, I wish I’d been able to run outside for some of those, but it’s so nice to know that with some time away coming up I don’t have to stress it and I can start anew in March for March-August. It was also really nice to know that even with the annual fee billed in November I’m under the $200 reimbursement from Oxford so the gym is free. Pre-packing for Florida has been fun. 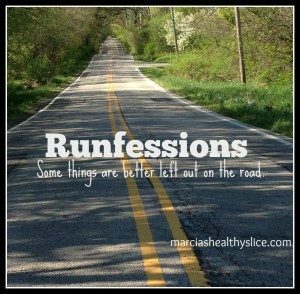 I asked in a running group about things people wished they had for their first destination run-and some things came up that I hadn’t even thought of, like bandaids. I did finally find my sunglasses, so that’s a win. Need to trial running in a ballcap as I never have and think I’ll hate it. On to the next, probably after my Half. I don’t think Ive heard of jogging being defined as slower than 6pmh. Its definitely one of those words that runners dont like to use but I think most non-runners use it to have the same meaning as running. Who knows. 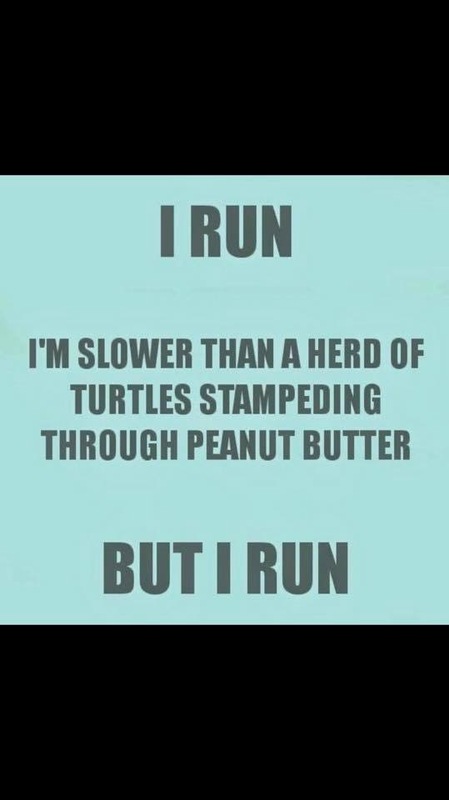 But anyone who runs at all is definitely a runner! Great job with your workouts and Im glad the gym has worked out well for you! Its definitely nice to have a treadmill to run on in the winter. It’s more or less how I feel, although I don’t care if someone chooses their clothes because they’re cute. Way too much policing going on Speed, clothing. 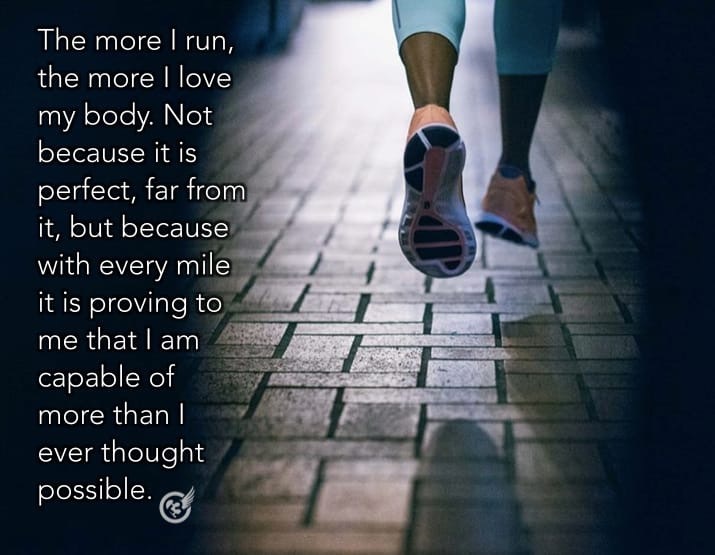 You are indeed a runner. You’re faster than me now a lot of the time, and you wouldn’t call me “Not a runner” would you? And good luck for Florida! If you need a hat for the sun, you could try a buff instead as they don’t come off so easily or make you so hot! I’m hoping the Expo has buffs. It’s what someone suggested but I don’t own and couldn’t find warm weather one here. They’re all fleece. Bringing the visor I’ll need poolside anyway otherwise I’ll just plan to run in sunglasses since, touch wood, heat shouldn’t be a major issue (6a start). Oh, I just buy them online with Amazon Prime, i have to admit. But there will be some down there. Go well!